As Americans we should all condemn and speak out against bigotry and hate wherever it may fester and whatever the ideological and political beliefs of the adherent. In most of the main stream media, and various periodicals and internet news sources, there are discussions and articles, editorials and letters to the editor that discuss the Charlottesville protests and subsequent violence, and the tragic death of a young woman. The gist of the outrage is directed at white nationalists, white supremacists and neo-Nazi, however no mention is made of the group antifa (anti-fascist). Antifa can trace its roots in Europe back decades and began there as a political movement, but it has crossed an ocean, and has now morphed into a bunch of radical militant leftists. The president was correct when he stated the violence was perpetrated from groups on both sides. But for whatever reason antifa is escaping any condemnation or scrutiny. In 2016 both Homeland Security and the FBI designated this group as domestic terrorists and “becoming increasingly confrontational and extremely dangerous”. 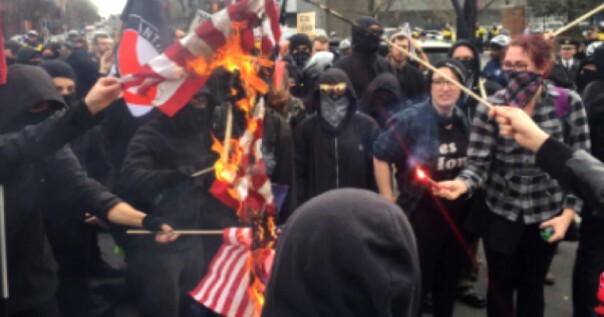 Keep in mind, together with Black lives Matter, this is the same bunch of masked thugs that left Ferguson Missouri and Baltimore Maryland in flames. They have also been the cause of civil unrest and violence at University of California at Berkeley, and there is reason to believe they perpetrated attacks on Trump supporters at rally’s and during campaign events, and also at the presidential inauguration. Their manifesto reads like a page out “Rules for Radicals”; anti-government, anti-capitalism, anti-Trump, fighting right wing ideology, white nationalism, and police brutality. They would deny the right of free speech to anyone who disagrees with their beliefs, such as conservatives, and that would include people of faith, politicians, just ordinary Americans, and would have no hesitation to do so with violence and property destruction. Antifa is not discriminating in who it is they target; veterans, police, journalists, and innocent bystanders. In a recent Berkeley gathering devoted to prayer, antifa appeared and caused a commotion and created a climate of fear and a threat to the participants; the gathering was canceled. In this case, as in others across the country, Charlottesville included, law enforcement was told to stand down and not to interfere. Does it seem that the Caucasian race is taking a pounding these days, white men especially dead or alive? Most of the outrage over Charlottesville is directed at the predominately white groups. On college and university campuses whites are being disparaged, treated with contempt and considered pariahs, and relegated to what seems obscurity. Courses dealing in so called white privilege and white supremacy are part of the curriculum. Black students are demanding segregated dorms, whites not allowed. Out of Charlottesville a new fad is all the rage, the removal of statues and plaques, most if not all devoted to white men. In some cases historical evidence reveals that the figures in question were not perfect beings, and their lives had in fact there darker days. But to judge their actions hundreds of years ago by today’s standards is ill conceived and will deny generations who follow an accurate account of the true historical past. This has not stopped the liberal progressive grievance industry; the arbiters of what is right and wrong, from insisting on the removal of any monument they believe are disturbing and hurtful to certain minority groups in America. Now to add insult to injury, the declaration and menacing beliefs of radical leftist ideologues shows no favor, no one is exempt. Whoever you are, whatever your station in life, and no matter your age, you will not escape their uncontrollable, bigoted and deviant actions. In New York City the Bank Street School is a progressive elite upper West side institution for children from nursery through 8th grade. However, aside from the regular curriculum, these innocent 6 and 7 year old children have also been taught that the fact they were born white makes them racist. Yes folks you read that correctly. This was brought to light by outraged parents who in some cases had their little ones arriving home in tears. One indignity after another, will it ever end. In the aftermath of hurricane Harvey, aside from the usual charitable organizations, other groups have appeared on the internet that is also asking for donations for the victims of this destructive and deadly storm. However in several cases, one in particular, organizers of the “Women’s March on Washington” from early this year asks for donations to be sent to certain so called charitable groups that will disperse funds to minority people only, white people are excluded. If we fail to recognize these growing menaces, antifa and our own American version of an intifada against white people, and that I believe pose more of threat than any right wing group, we will rue the day and and so to will the generations who follow.